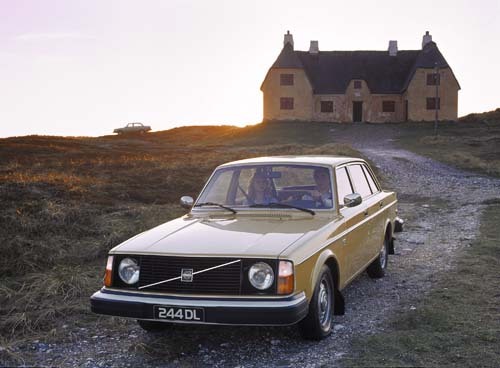 1975 – Volvo 244 at Det gule Hus, south west of Hanstholm in Denmark. 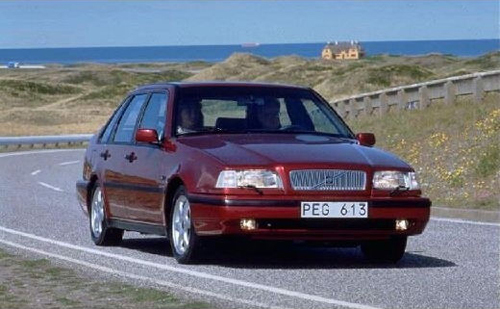 1995 – Volvo 440 at almost the same location as above, near Det Gula Huset in Hanstholm, Denmark. 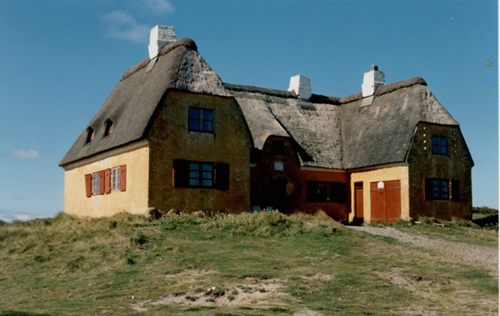 Det gule Hus (or the yellow house) was located between 1916 and 2000 south west of Hanstholm, on Jylland in Danmark. The house is also known as Strandgården or Nørtorp Strandgård (the official name). Hanstholm is a small town and a former island, now elevated area in Thisted municipality of Region Nordjylland, located in the northern part of Denmark. In the end of the 20th century, Denmark’s largest harbor was built in Hansted, and a 10-fold bigger harbor town was needed. A new town was planned, covering the places Hansted, Gårddal and Nørby, and the new town was officially named Hanstholm. 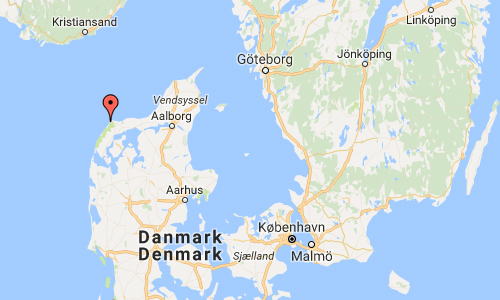 This has led to quite some confusion, because the people from the towns Ræhr and Vigsø live on Hanstholm, the former island, they live in Hanstholm postal district, they live in Hanstholm municipality, but they don’t live in Hanstholm town. However, since all the parts of this new harbor town belong to Hansted parish, and because Hansted has been the harbor town for so many centuries, many people refer to this town simply as Hansted instead of Hanstholm. Remains of the largest World War II fortress. The largest industrial harbour in Denmark, with fish auctions at 6.30 in the morning etc. West coast of Denmark. It’s rough, it’s windy. Fishing. It is possible to fish in the ocean at the Yellow Reef, fish from the beaches or in put-and-take lakes. Geology. The stone age coast line is visible, and it is even possible to find fossils at many places. Nature. Hansted reservat and many places on Hanstholm have unique plants, animals and places that don’t survive in other places. Small plane flying. There is a small airport nearby. 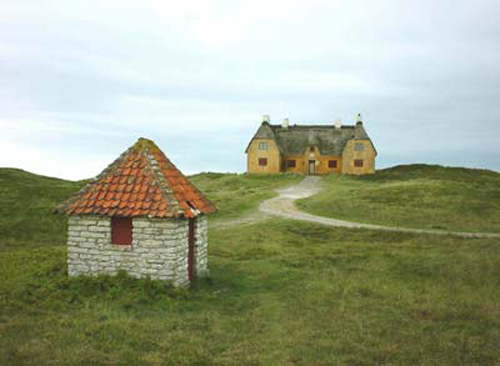 With faded and boarded oak doors the magic castle in the remote dunes located south of Hanstholm. 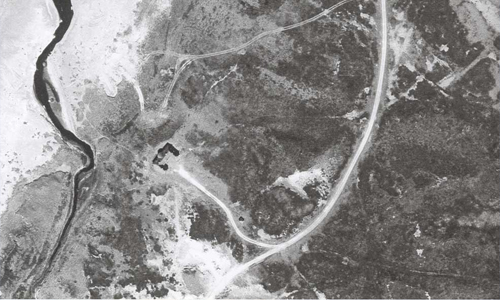 When it was built in 1916, it was still the loneliest located castle of the country. No path led there and it was far away to the nearest habitation. 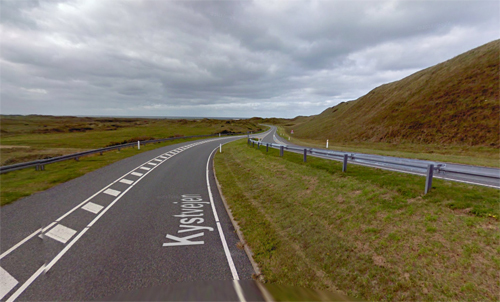 Now cars drive on the new coastal highway passing, but few know that the castle close by the sea in his aloofness hides a piece of Danish history, and that princes and princesses had found here once a paradise in the white sunny dunes. 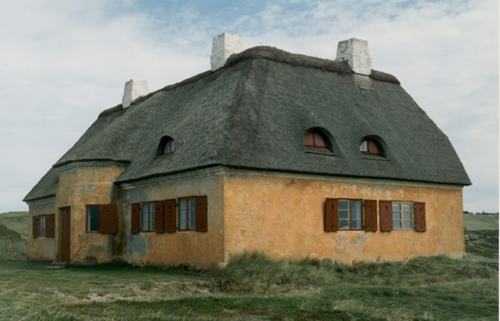 The yellow building with the black chimneys (later these were white) on the thatched roof, had another summer palace, namely “Klitgården” in Skagen as an example, as it was built in 1916 by the industrialist and shipowner Axel Olaf Andersen. On the oak post above the main entrance, a crossbar is connected to a Bark – the logo of the shipowner – carved Andersen wanted to “talk” with his ships passing by! 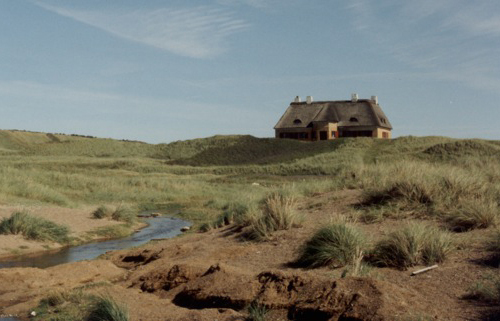 1999 – Det gula Hus at Hanstholm on Jylland in Denmark, seen from the coast. Why did this wealthy shipowner, whose name is inextricably linked build with lines such as “Valkyries”, “Viking”, “Gorm”, “Skold” and “Carl”, wanted a summer palace in this remote wasteland? Well, 1916 was still so far from the technological age, and in the Danish merchant fleet known to little of telegraphy and radio as a means of communication. When the ships were many months on the seas moment during the First World War 1914-1918 go, the return was connected with great excitement. This led to build the shipowner in Hanstholm. If the vessels in the Skagerrak should enter bound for Copenhagen, Aalborg and Århus, Hanstholm was the first piece of Denmark, where they would show up and so Andersen would be first to know and could welcome his ships. Close to his summer palace, AO Andersen built therefore a high signal mast, with which he communicated with the aid of signal flags in all sorts of patterns and colors with his ships, and could, if they were returning home passed the peak of Hanstholm or there dropped anchor. As the then Crown Prince Frederik was a friend of the shipowner and his son, a king room was set up in the yeloow house. Here even the stove had a royal crown as a hood! Since both the Royals and the posh Copenhagen society visited the shipowner in his summer palace, which was christened “Strandgården” was decorated with many rooms and and a large fireplace room, where they could enjoy the twilight by the fire or the red sunset watching. “Strandgården” could provide as much comfort as a palace in the capital of Denmark, Copenhagen. Because of expropriation and land purchase in connection with the extension of the port at Hanstholm, “Strandgården” in 1921 the Danish state became owner of the building. It should be a house for the port project manager. But they had no real interest to live in a house that was so remotely located and had no road connection and had no neighbors! A life artist and philosopher became then the lord of the manor for many years. For 322 crowns, the writer Bertel Budtz Müller (1890-1946) rented “Strandgården”. Actors, painters, sculptors and writers gathered around the cheerful and generous Budtz Müller, who always had herrings in a barrel, smoked lamb in the chimney, old cheese cellar and brandy in the cupboard! Was the vast Bertel Budtz Müller huge in seize with a deliberately walk, his successor at “Strandgården” was light footed as a deer: Ingeborg Brams! The royal actress Ingeborg Brams (1921-1989) had to pay up to 1,000 crowns a year to rent “Strandgården” as a summer home. But as Bertel Budtz fit into the Adventure House, it was now a romantic frame around the new Ingeborg Brams, a slim woman from the national actor scene. No one looked at her solitary wanderings in the 4000 hectare wildlife reserve, which was adjacent to “Strandgården”. Dunes, dune lakes, pine plantations and wide land were at its disposal. Here indeed no people lived there and no one went on a trip to these lengths. The result once myths and rumors about the massive Bertil Budtz who could be dark and rumbling like the sea itself, when the problems were too much for him, the summer Ingeborg fit just perfectly into the panorama of the sun-bleached dunes and glittering dune lakes. She was a woman castle of the same aesthetic appeal as the evening mist that floated on warm summer evenings on the heath in enchanting dance of the hills. In the later years “Strandgården” was the summer home of a doctors family from Copenhagen. Now they had to pay for a month as much as before in the whole year! In the evenings, the Hanstholm lighthouse set his bright rays over the sea. These also met “Strandgården” short bill and in this second castle was bathed in light. In a few years “Strandgården” is no longer lonely. 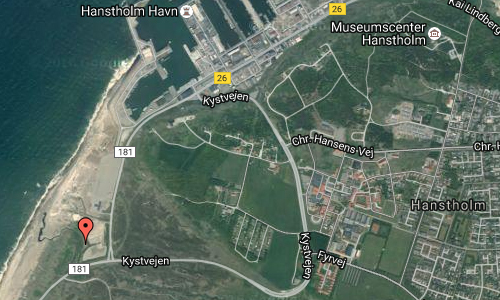 There will be a major expansion of Hanstholm harbor that will reach into the dunes and on this building. Then the house will be so close to the quay walls, that it will be a central location, sought after residential opportunity! End of the article from 1975. Unfortunately, the building has not survived time and was demolished in the autumn of 2000, after many protests of locals. A yellow house. A small slot. An epoch. 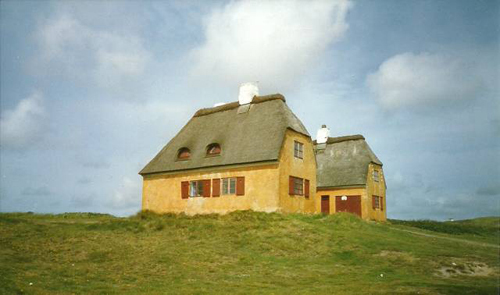 The yellow house in Hanstholm was demolished in late 2000 in connection with the expansion plans of the port. Before, there had long been a debate in the newspapers about the house with an interesting history – it was not worth preserving and could house does not have a role in modern Hanstholms history? 200 signatures were handed over to the Mayor Aase Jensen, but it was not enough to convince the governing authorities. The argument for the demolition was that the house was in the way for the port’s future development, and if the house would be, it would be too expensive to restore. October 30, 2000 was the demolition work started. Before that, the Museum of Thy and the North Hanherred photographed the yellow house, so that today it is possible to walk in the traces of the past. The house bar to the last imprint of the time it was built and decorated in. It had 700 people been able to ascertain, since a few years earlier – when the proceedings of the house’s future appeared – was an open house. The cars were parked close to the house and there was a throng of people in and out in five hours that were open. The yellow house was built in 1916. It told a large stone that was walled in the front door. Nørtorp Strandgård – the official name of the yellow house – was built by shipping magnate Axel Olaf Andersen, called a tycoon whose ships sailed in the years around World War. He put a signal pole on the west side of the house. Using it, he could signal to his ships and get a first orientation on how the race had elapsed before the ships came to port. And that is the explanation for what caused a Copenhagen shipowner to build a summer residence at such a remote place as in the trackless terrain in Hanstholm Klithede. The yellow house – the small castle – holiday resort of among other Crown Prince Frederik (Queen Margrethe’s father), who was a friend of Axel Olaf Andersen and his son. Crown Prince used extensively house during hunting. It was also the shipowner passion – beside the ships and asset management. When there was a fine visit from the court and all his attentions were lit up in the fireplace hall, the castle many rooms were tastefully decorated. Cheerfulness, buttocks and fine hunting dinners with fine wines embossed The Yellow House in those years around the First World War. In 1917 came the law on the port and thus began the state to expropriate an unbelievable Hanstholm. It was not until 1921 Nørtorp Strandgård changed hands. Since then belonged to the property state. The yellow house was to be used for rental. First of all, the port engineers – it had not much interest. There was not any real roads! 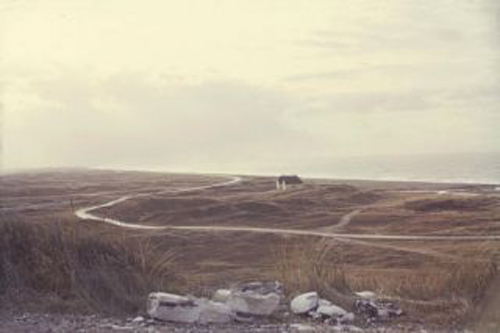 But others saw the possibilities in the unique location in the middle of the dune landscape and so close to the sea. All this is now history of lived life, one might imagine, when you look at the pictures that were taken just before decomposition machines took over to make room for modern times in Hanstholm. More information at www.arkivthy.dkwmosejens.dk, www.hanstholmregistreringen.dk and en.wikipedia.org.